$1350.00 (Price INCLUDES shipping) Mini Broncs Saddle Made with Roughout leather unless combination requested. 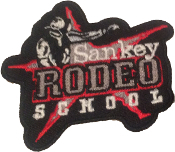 Star Rider Sankey Rodeo School logo embroidered, self adhesive patches. 2 3/4"x 2 1/2"
Former Sankey Rodeo School Student discount available, click here for instructions on how to receive your discount! $1350.00 (Price INCLUDES shipping) Complete with Bonus FREE Bronc Rein ($35 value) for former Sankey Rodeo School Students. Made with Roughout leather unless combination requested. 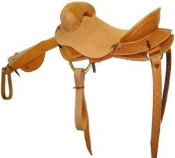 Back Cinch $62.00 Back Billets $75.00 or Back Cinch and Back Billets for $132.00 Doubled and Stitched Back Cinch Former Sankey Rodeo School Student discount available, click here for instructinos on how to receive your discount! sankeyrodeo.com Price $14.00 a pair Sankey Rodeo School Student Price: $12.00 a pair Former Sankey Rodeo School Student discount available, click here for instructions on how to receive your discount! Pro Neck Rolls (leather or cordura) by Ride-Right Small Five Point Rowels - the standard for Saddle Bronc and a very fast rowel a few use in Bare Back. 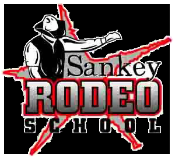 sankeyrodeo.com Price $9.95 Sankey Rodeo School Student Price: $7.95 Former Sankey Rodeo School Student discount available, click here for instructions on how to receive your discount!